A police spokesperson said, “The Bermuda Police Service is aware that kite flying has been a staple of Bermudian culture for years. “However more recently, reports have been received of kites being flown to the annoyance of other residents. 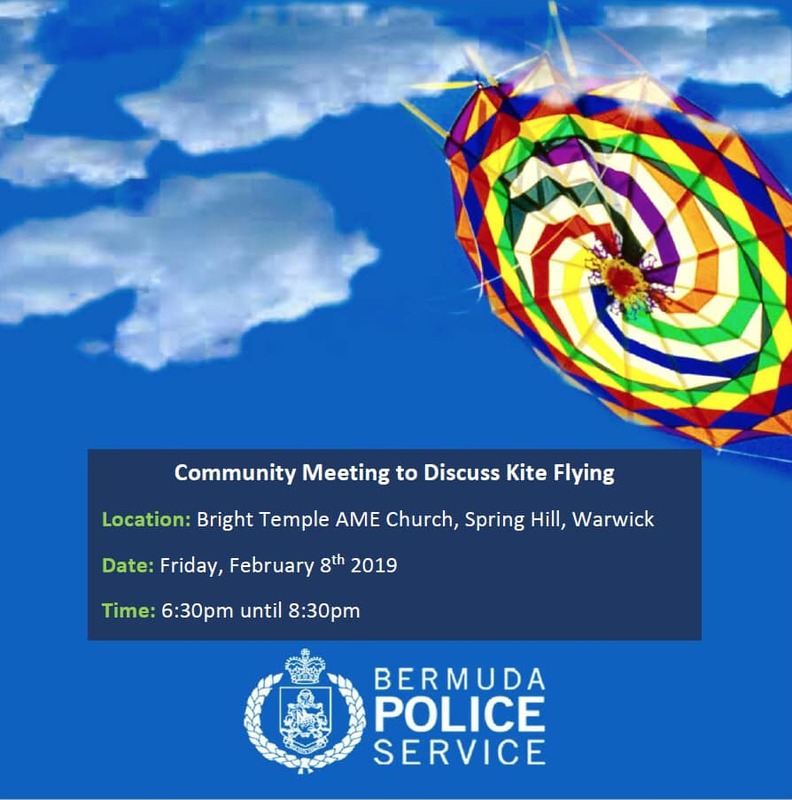 “In light of this, Western Community Action Team officers have organised a community meeting at Bright Temple AME Church in Spring Hill, Warwick from 6:30pm until 8:30pm Friday, February 8th to facilitate a discussion regarding kite flying, which will allow different viewpoints to be expressed and potential solutions to be identified. All it takes is for people to be reasonable in their use of hummers. Yes but you’re talking about people who think they are entitled to be as unreasonable as they like. I should go to this if for no other reason than to watch the offenders accuse the other side (to their faces nonetheless) of not being Bermudian. If you look into the history of kite flying, yes, it is very Bermudian. However if you do your research on hummers I think you would be surprised. Hummers were first introduced back in the early 1600’s and were used as a means to attract a partner. The first known users of hummers were losers and/or lacked the physical appearance to attract a mate. As this newly found technology developed a trend was soon realized that the louder the hummer the smaller the endowment of the user. Exasperated at the lack of a partner these hummer grew louder and louder. Fast forward 400 years, people are getting vexed. In a unique twist of events and in uncustomary fasion the Police Western Community Action team has organized a speed dating event disguised as a discussion in hopes that the poor hummer will find a mate and restrict putting their roots on display to Good Friday. I wish you hummers all the best and remember, opposites attract! Kite in Pembroke yesterday driving me crazy. No need for it. MInd, Gombeys starting drum practice at 8pm isn’t great either. How else will they advertise their products? Yea but is it against the law to fly a kite???? Is it against the law to own a motor bike ? No , of course not . But it is illegal for it to be too noisy ! Wonder why that is ? Kite, no. Loud noise, yes. if we stop kite flying will we be willing to face the negative consequences. idle hands. let the people fly their kits and clear their heads. kites represent freedom though being able to take to the sky like the free birds the long tail. People fly kites to com themselves down when life is rough just like fishing off the rocks except in kite flying everything is re-usable. I used to fly kite for that same reason. I would put the kite up them lay back in the grass looking up to the sky watching the kite and think to myself. some times to find a better solution to life problems other than violence. trust me when i tell you they are not flying the kites for nuffing there is a reason and it is a better solution than what they could/would be doing. We Bermudians are becoming victims to globalization something that seeks to destroy our culture and in turn destroy our people turning us against one another in pursuit of personal gain to the extent to where it become greed. prime example Bermudians used to talk to one another on the street now things have changed due. this change in our culture now affected how we see eachother to the point where we will drive right pass an traffic accident with someone in need like they was not there. we watch fights on the street and no one breaks it up the list goes but my post is long. Bermuda see whats happening to us an fight it if we do not we will lose our selfs and become just like the rest of the world. Remember this is Bermuda We are Bermudians please let it stay that way fight for Bermuda. Don’t be ridiculous. Nobody is saying don’t fly a kite. Please do. Just don’t make them annoyingly loud with the hummers. How hard is that to understand? What part of annoying people is in our culture? I am a BORN BERMUDIAN before you suggest I am an expat. Stop making this a cultural issue when the kites you KNOW are being complained about are simply because of the obnoxious noise they produce. BORN BERMUDIAN means nothing anyone can be born here. what makes a True Bermudan is the culture and the culture is passed on from generation to generation. only then you develop a culture defense because the culture become you and you become the culture 2nd nature. anything else leaves you to make judgment from and outside culture perspective the culture passed on to you from your mom and dad and their mother and dad. It’s a pity the culture doesn’t include being considerate to others. You can ask a party to turn down their music, a car driving with music too loud can be stopped, but yet you can have a kite above your house louder than a weed eater outside your front door on a Sunday morning and nothing can be done. These are not traditional bda kites!!! they are built to annoy. Thinking of taking up the bagpipes or violin and practicing next to these kite fliers, wonder how that will go down? Probably be arrested for being a public nuisance . As long as you wear something under ya kilt. I think we need to stop saying Kites are the issue and be more direct by saying “Hummers” are the issue. There are waayyy too many people on this island who are not smart enough to connect the dots and understand its the hummer that is a nuisance, not the act of flying a kite. Next, can they arrange a similar meeting to discuss the incessant noise-making kite-fliers of Shelly Bay. Whenever there is enough breeze, residents of the area have to put up with constant hummer activity. THESE ARE NOT TRADITIONAL BERMUDA KITES. They are made with thicker wooden sticks, screwed together…nylon stringing and plastic patches; coupled with a thin metallic hummer. I know all of this because there is a guy out there that actually tutors persons on making these excessively raucous abominations. Get it in your heads, your friggin kites are annoying to all except your tiny click of losers with nothing better to do. Get a job or a less annoying pass time…please. I love kites, I love flying kites, I love Bermuda kites…. I DO NOT LOVE listening to a kite, as loud as a weed whacker over my house for 10 hours straight…can someone please explain what that is about….you fly a kite for a bit, play with your kids, take it down….what’s with the 10 hours?? I have a drone with razor blades on it and will start a campaign to cut the string on every kite I find in Bermuda! These bozos will get tired of losing money for each kite they lose! Game on vigilante style! The Punisher. No one is complaining about the kite flying !!! Read the article again for Christ sake!!!! It’s the screeching noise. Years ago it was a pleasure to see and hear a Bermuda kite flying. Those of you saying get over it either are the culprits or don’t hv them screeching over your house for days!!! Those idiots flying those kites need to realize that the kite they are flying is not directly above their house it’s above somebody else’s house and annoying them. What has happened where we live in a society where nobody gives a damn? the kites to advertise drugs for sale.